Test-driven development (TDD) is a software development. 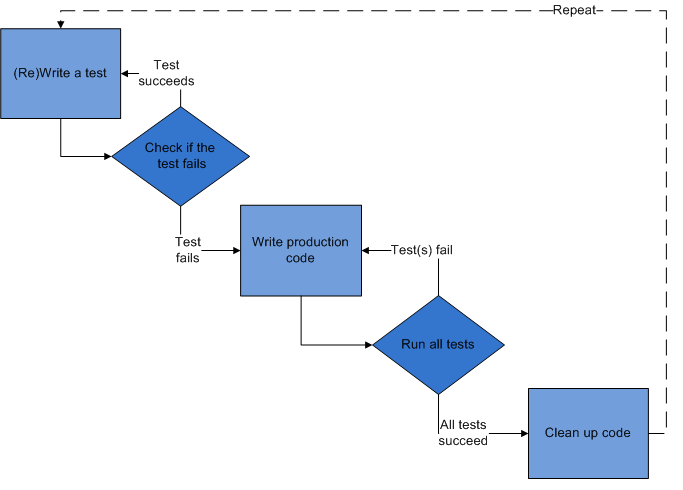 First the developer writes an (initially failing) automated test case that defines a desired improvement or new function, then produces the minimum amount of code to pass that test, process that relies on the repetition of a very short development cycle and finally refactors the new code to acceptable standards. First, the developer writes some (initially failing) tests. The developer then runs those tests and they fail because none of those features are actually implemented. Next, the developer actually implements those features in the code. If the developer writes his code well, then the in next stage he will see his tests pass. The developer can then refactor his code, add comments, clean it up. I execute the test class again, and now all test cases are passed. Now we can repeat above steps by adding more test cases. Starting with another new test, the cycle is then repeated to push forward the functionality. The size of the steps should always be small, with as few as 1 to 10 edits between each test run. If new code does not rapidly satisfy a new test, or other tests fail unexpectedly. Using TDD approach we can write an effective, organized and neat code. Also Encourage the writing of quality code.